Ensure compliance and alignment to customer requirements. 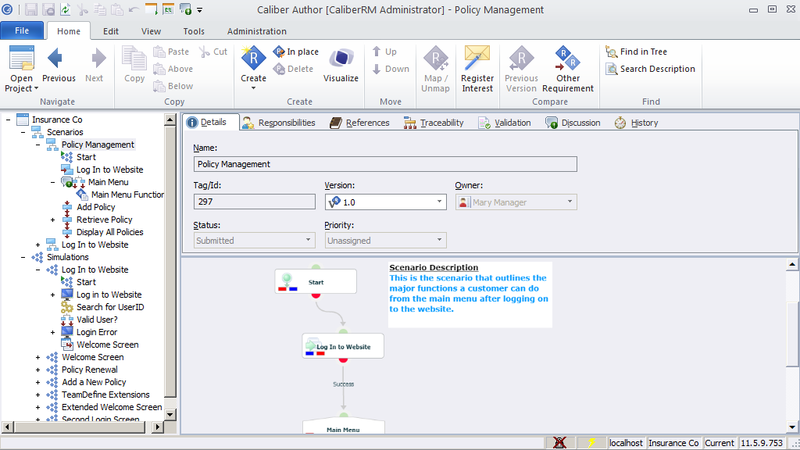 Use traceability to model internal relationships between requirements with regulatory controls. This traceability supports impact analysis, so you can understand how changes to requirements impact your project. Visualize requirements as interactive, testable user flows. Automatically generate test cases from defined scenarios and collect feedback in context to ensure that requirements are clearly defined. Maintain your project scope and ensure compliance through automatically generated trace tables. The built-in controls immediately detect orphans and highlight suspect traces to ensure project quality. Send related attributes, traces, and discussions to stakeholders for review. Create filters to show only items which require review and approval. Capture approval quickly and precisely with electronic signatures. It’s a good investment. With Caliber, we have seen that design studies are faster, and testers can find the information they need much quicker. The result is better quality applications for our customers.